There are times in life when all you want is a chance to unwind and grab a piece of brain candy and let it do its trick. I’m sure, dear Reader that you can relate. We all have our own favorite brand of brain candy. For some it may be a historical romance, for others it may be time to let a familiar detective lead the way as he solves yet another case. For me, it usually something light and humorous; something that makes me laugh without having to think about why I’m laughing. I started a new job a few weeks ago, and I am still adjusting to my expanded role as a program supervisor. Some nights I come home wanting nothing more than sleep, though I know this will only result in a very early wake up call from my body. I know if I go to sleep at 8, I will be awake at 4. This is not a viable solution to my brain melt. Something has to occupy my mind without taxing my brain, which is why I decided to finally pick up a book I bought back in May. I had high hopes for this particular book. Doctor Who The Shakespeare Notebooks should have been savory piece of brain candy. Regular readers of this blog will recognize right away why this title appealed to me. 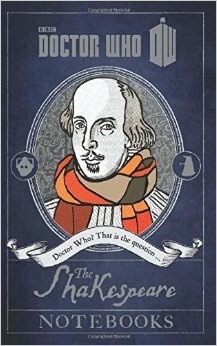 I am predisposed to like anything with Shakespeare in the title, and equally predisposed to giggle over anything Whovian. Combine the two and I am in geek heaven! At least this is what I thought. The premise of the book centers on newly discovered “lost” Shakespeare notebooks; journals that William kept as he wrote his famous plays. The notebooks contain “lost” scenes and general re-workings of dialog and soliloquies. Peppered between all of this lost material are references to a certain strange man who pops in and out of William’s life via a blue box. Hamlet- son of a dead king (hence “Prince of Denmark”) discovers his uncle murdered his father and married his mother to steal the throne. Probably drives him mad. Well, it would wouldn’t it? His mother confesses- except she wouldn’t know, would she? His uncle confesses – Why? That’s asking for trouble! A magician tells him – ah, most plausible. Such things are common in the theatre. I sat in stunned silence after reading this. Had I been 12, this may have tickled my fancy. I may have even giggled. But as an adult, this fell flat, and left me wondering who was the attended audience was. “Damn”, I thought, “This is a kid’s book”! The thought that this was more of a children’s take on Shakespeare, allowed for the juvenile humor. I read on, attempting to get into the mindset of a pre-teen. It didn’t work. As I read on it only got worse. The next part of the book talked about missing scenes from Macbeth. The notes, made by the authors who “found” the notebook, hinted that the play, one of the shortest of the tragedies, was originally just as long as Othello. One of the missing scenes involved Macbeth and Banquo meeting Doctor Who and two companions, not three witches. It is one of the companions who blurts outs, “You’re Macbeth the future King!” He knows this because he read a play about Macbeth. Huh? Shakespeare is writing a play about time travelers who meet Macbeth and tell him he will be king because it is written in a play? Oh, okay…. The Doctor is dismayed by this out burst and spends the the rest of his time in the play trying to stop Macbeth from becoming a murderer. This has to be a children’s book, right? No adult would buy this plot as the only sensible thing for the Doctor to do, would be to go back in time again, and stop his companion from meeting Macbeth. I know, I know, I am way over thinking this. This is one of many problems with this book; it’s not funny and makes little sense. The authors failed to realize those who read Shakespeare or can follow a Doctor Who plot are smarter than this. I say authors because there are five; one of which should have at least considered the idea that none of this would work. Now, I know, I am being a little unfair. Pre-teens may enjoy the antics of a Time Lord popping into plays only to realize he has already read the play, but all I did was groan. This may have worked if the authors had written a Doctor Who Notebook. One in which the Doctor finds himself in a play, but having Shakespeare write these scenes just didn’t work. Oh, yes, I realize Shakespeare wrote plays within plays, but when he did it he separates the plays; his players watch other players. These authors may be trying to play with time, I’ll give them that, but the result is just one big wibbly wobbly timey wimey mess. I just couldn’t bring myself to finish the book. I contemplated handing this to a friend’s pre-teen in exchange for a review. Surely my take on it would be harsh and unfair, as I am clearly not a member of the target audience. But before I did, I wanted to confirm the target. I would have felt bad if I had unknowingly given a young girl a book that contained bawdy parts. Wow, was I in for a shock; the Doctor Who The Shakespeare Notebook is labeled as an adult humors book! If this is adult humor, we are surely lost. I can take heart by the fact that only 12 people bothered to review this book, and the reviews are mixed. While I don’t know the ages of the reviewers or their reading levels, I can argue with the two that said, “Fans of Shakespeare will like this book”. No. No, they won’t. This was a bitter disappointment, and a piece of brain candy I just couldn’t choke down. One to miss, then! I saw another review which suggests that the readers needs to have an encyclopaedic knowledge of the complete Whovian sequence of episodes going back to 1963 to appreciate the references. That’s me out. Maybe as you get deeper into the book the references become harder to catch. From what I read, the Doctor is Tom Baker’s incarnation minus any real personality. Now I like Shakespeare and I like Doctor Who (though most of what I’ve seen has been of Doctors 3, 4, and 5). What you describe does sound . . . silly. Maybe a better idea would have been telling a story about the Doctor collaborating with Shakespeare on one of his worse plays, perhaps “Pericles.” Or, better yet, collaborating with Shakespeare on the lost “Cardenio,” and then all the copies being destroyed after a few performances because otherwise it would reveal the Doctor’s presence to some enemy. That would be, to me, more interesting. I agree. From the blurb it sounded like we would read about the Doctor’s, influence on Shakespeare’s work & learns about some of the plays’ “back stories”. Instead we are treated to a literary mash-up that doesn’t work. Now just think of the havoc the Doctor could cause in “Jane Eyre,” though Jasper Fforde has kind of beaten us to that idea in general. I wish I could get into Jasper fForde as he apparently had written something involving Hamlet. I’ve read and laughed at some of the quotes. I’d liked the first two or three Thursday Next novels (even though there’s a major discontinuity between the 1st and subsequent books), but after that, I thought he was beating a dead horse. Someone recommended him because I love Terry Pratchett. The recommendation was way off. I tried reading the first Thursday novel but just could not get past the first few pages. Have you read Something Rotten by chance? If so, it is worth picking up? I’m afraid I’ve not read it. Now have you tackled Christopher Moore’s “Fool” and “The Serpent of Venice”? I loved Fool but did not like the Serpent of Venice. I felt the characterization of the Fool in the second book did not match the first. He was too jaded for my taste. You? I read them far enough apart that I put down the difference to his losing Cordelia. That said, every so often I had to double-check myself to remember which of Shakespeare’s plays Moore was riffing on at any given point.